This weekend, Amanda “Lioness” Nunes — an openly lesbian mixed martial arts (MMA) fighter from Salvador, Bahia, Brazil — made sports history by becoming the first female Ultimate Fighting Championship (UFC) competitor to win two championships. Nunes fought as a featherweight against Cris Cyborg, a 33-year-old competitor also from Brazil. 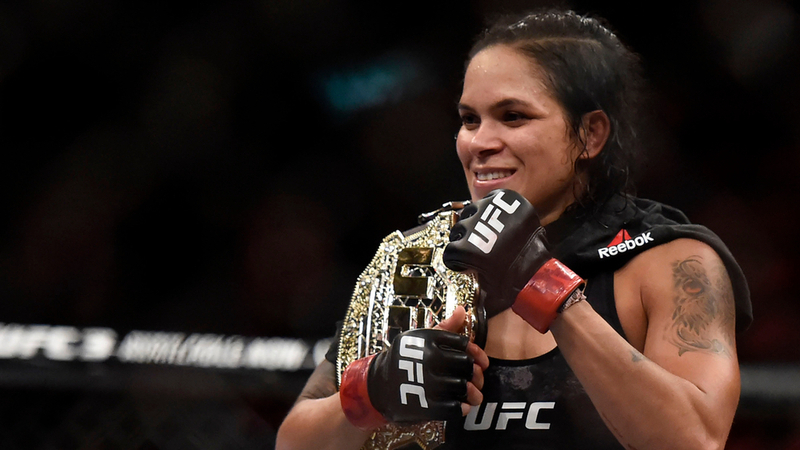 Nunes brought her down in 54-seconds — the sixth fastest female knockout in UFC history. Amazingly, two of the other top five fastest female knockouts in UFC history also belong to Nunes. Nunes won her first UFC championship in 2016 in a quick, brutal bout against Miesha “Cupcake” Tate. In the first round, Nunes broke Tate’s nose. Then, with Tate’s nose bleeding all over the canvas, Nunes got Tate to tap out by applying a rear choke. Despite the sports’ brutality, MMA has a handful of openly gay competitors, and most of them are women. Tecia Torres, Raquel Pennington, Jessica Andrade, Nina Ansaroff, and Liz Carmouche are all openly lesbian MMA fighters. American brawler Shad Smith is the only openly gay male MMA fighter we know of. Smith (aka. “The American Bad*ss”) is a lightweight fighter from California with 14 wins and 24 losses on his record. He’s 45, bald and has lots of tattoos — rawr! Anyway, back on the women: Nunes actually defended her title against Pennington in May 2018, making their bout the first ever to occur between two openly gay fighters. What’s even more delightful is that Pennington and Torres are engaged, and so are Nunes and Ansaroff. In fact, Nunes and Ansaroff are set to marry later this year — fighters lovin’ fighters. Andrade proposed to her girlfriend on TV and in-front of live audience in a May 2017 post-fight interview after losing to Joanna J?drzejczyk.